FERRARI seemed to have the Australian FI Grand Prix in the bag, but a shocking high speed crash, a fire and an appalling start by world champion Lewis Hamilton turned the Melbourne event on its head. In the end, it was a one-two win for the Mercedes pair of Nico Rosberg and Hamilton, with Sebastien Vettel third in his Ferrari. Perth’s Daniel Ricciardo finished a fine fourth and also set the fastest lap time of the eventful 57-lap race at Albert Park. It was a good show by the Red Bull Renault driver, his car showing a decided improvement in speed, but the Ferraris were the real stars. Vettel and teammate Kimi Raikkonen took the lead at the start after pole-sitter Hamilton had his worst start in years and lost four places. 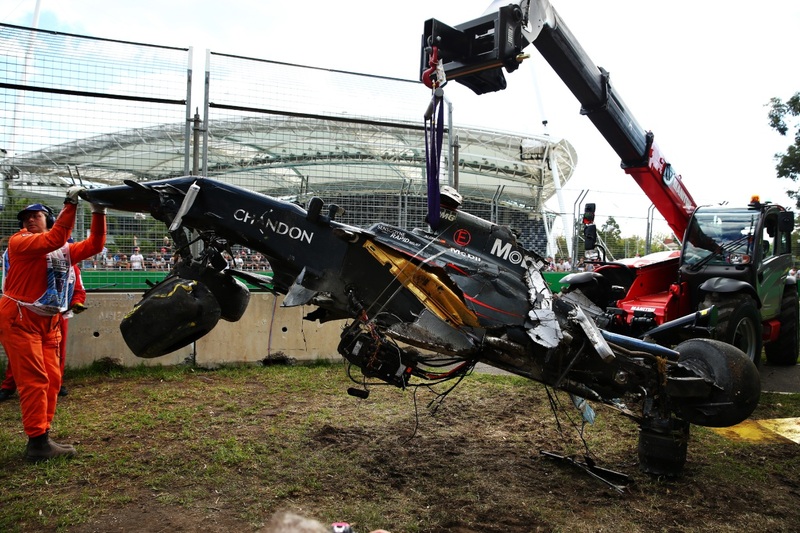 But a horrific 280km/h crash between Fernando Alonso in a McLaren-Honda and Esteban Gutierrez’ Haas resulted in a rare race stoppage to clear the debris strewn over about 200m of the circuit. When the race restarted, the Ferraris were still on a two-stop strategy of using supersoft tyres, while Mercedes fitted longer lasting medium compounds. That meant Ferrari would need to pit again, and Mercedes wouldn’t. So the silver German machines took the lead when the Ferraris stopped for fresh rubber. It got worse: the engine of Raikonnen’s Ferrari caught fire when he pitted. Vettel launched a lone attack, but fell just short of catching Hamilton’s car, and a hard-charging Ricciardo took fourth place, well ahead of Felipe Massa in a Williams. Frenchman Romain Grosjean, who started 19th, finished a sensational sixth in the all-new Haas, giving the US team some jubilation at a points finish in its first grand prix, but also some anxious moments when their second car, driven by Mexico’s Gutierrez, was hit by Alonso’s McLaren. Amazingly, neither driver was hurt and there was a touching scene when Gutierrez rushed over to the totally destroyed McLaren and embraced the shaken Alonso. Poor tyre strategy also hit the Toro Rosso team, which held fourth and fifth places early in the race, but finished ninth and 10th. Ricciardo was delighted with his result. “We had genuine pace and I was trying to get those tyres home, but it didn’t happen.